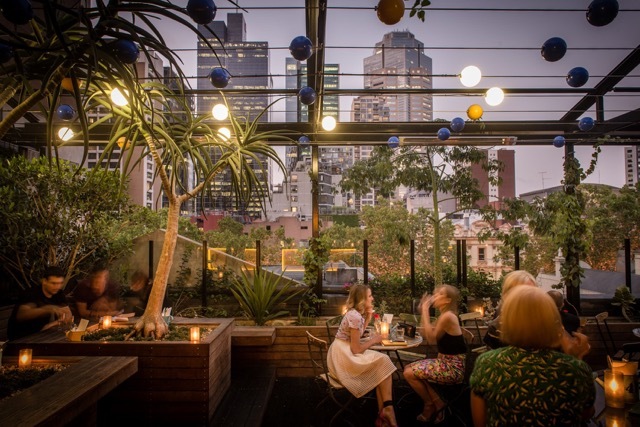 Melburnians’ love of rooftop bars is reaching new heights. As the nights are long and the weather is fine (well, most of the time), there’s no better time to bask in the city’s top open-air bars. Here are a few favourites. QT’s huge indoor-outdoor rooftop bar, QT rooftop, is open for sunset cocktails every night. The outdoor deck is enormous and slick, matched only by its glossy interiors. Seek out the central bar and find one of the many nooks for after sunset shenanigans. Siglo is an open-air rooftop terrace, upstairs from The Melbourne Supper Club. While it might not be your cheapest drinking option, you do get attentive table service, a substantial wine and cocktail list and sophisticated atmosphere. Siglo is geared towards a late supper, offering a range of options from foie gras to premium party pies, as well as classic desserts. Red Piggy delivers a modern twist on Southeast Asian flavours inspired by the old French Indochina region. This rooftop bar and restaurant is perfect for relaxed, casual dining, where groups can experience honest food, complemented by exciting drinks. Sit back, unwind and let this little (red) piggy feed you. Enjoy the view in any weather with plenty of cover and heating at Heroes rooftop. 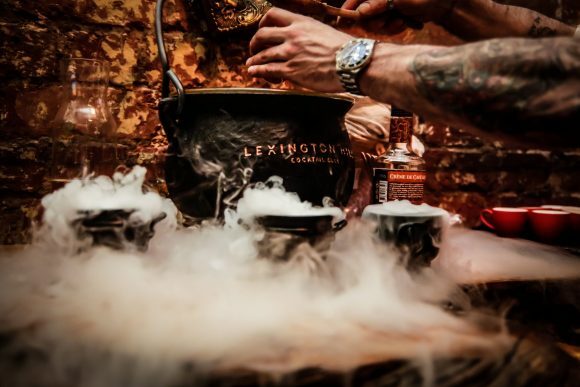 Or explore the other floors for private dining rooms, karaoke booths and a barbeque bar with hawker-style menu from the team behind Fancy Hank’s and Good Heavens. 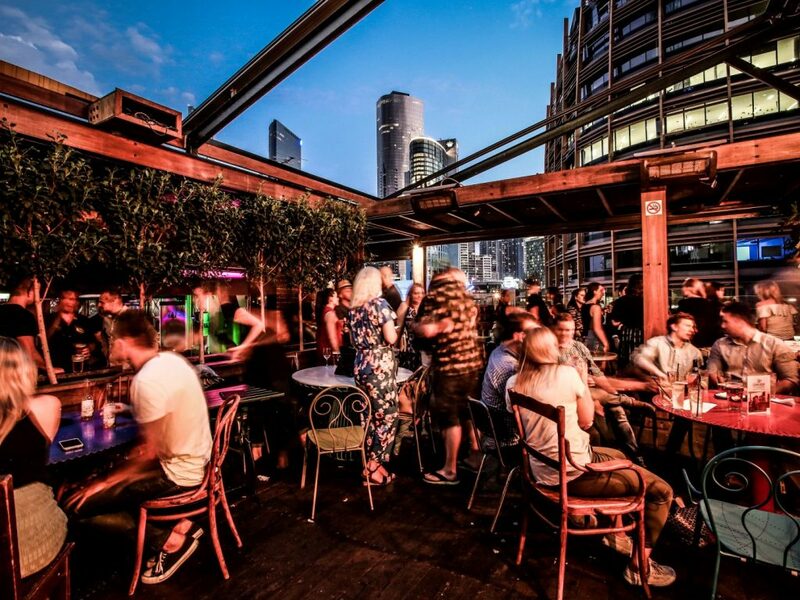 Head there on Sundays for rooftop Yum Cha at this secret bar on the edge of Chinatown. Recently reopened in an all new location, State of Grace are building (literally) on their success with a brand new rooftop bar space. Think cocktail jugs, grazing plates featuring fried chicken and grilled haloumi, and some of the most stunning views Melbourne has to offer. After a recent renovation, Melbourne’s oldest licensed pub now features a rooftop. The Duke of Wellington offers amazing views of the Forum, Fed Square and Flinders Street. Enjoy a cocktail from their seasonal menu, choose from their extensive list of beers and wines or sample the food menu while you take in the sights. We love the Lygon Street style lasagne croquettes. Walk through the original Australian red cedar doors dating back to 1858 at The Imperial and take a step back into Melbourne’s rich history. 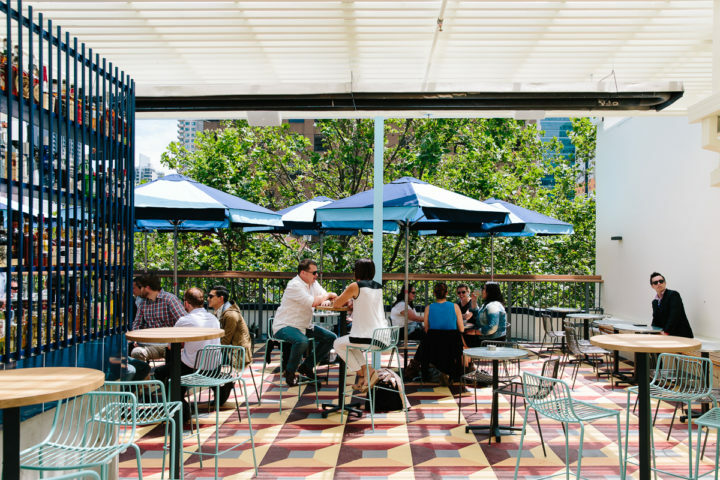 The rooftop beer garden is one of the largest in Melbourne and offers 360-degree city views. Tear your eyes away from the screens showing live sport for a spectacular panorama of Parliament House. After the much-anticipated transformation, there’s a new beginning for King and Godfree. A a favourite among locals for the best of Italian food, wine and hospitality, the new layout features a deli and espresso bar, wine bar and bottle shop, basement cellar and now a rooftop bar, Johnny’s Green Room. 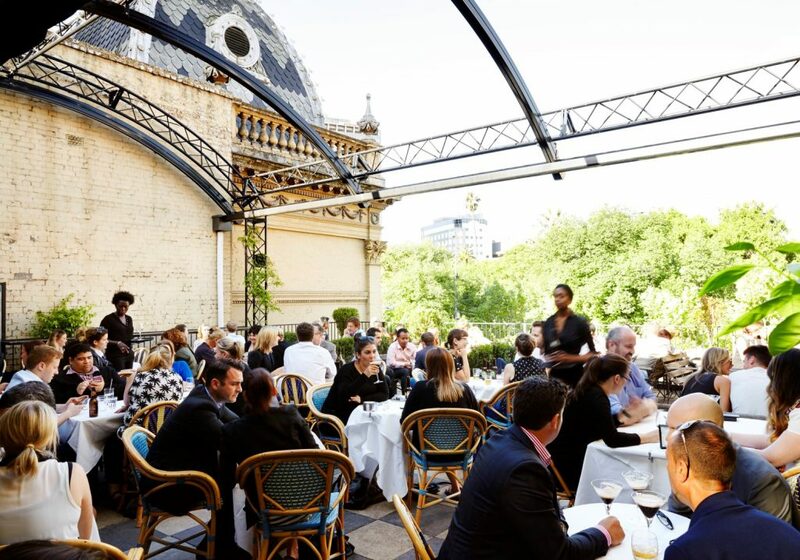 Gain a whole new perspective at this Melbourne institution with views from the Carlton end of Lygon Street, all the way to the city. The team behind Fancy Hanks have put their magic touch on Good Heavens, an Americana-themed bar offering cool cocktails and retro 80s vibes. 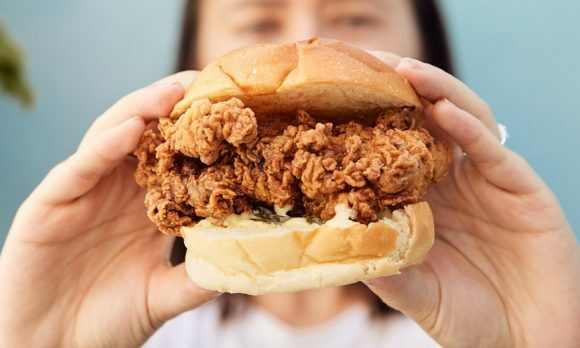 Head there for craft beers and wine, and a great range of sandwiches including pulled pork, smoked brisket, fried eggplant and buffalo cauliflower. It’s a great spot for a long lunch. 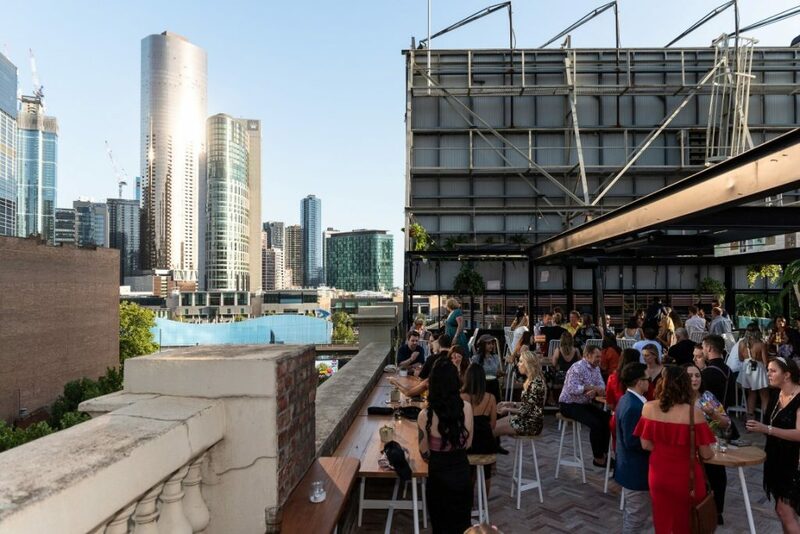 This grand, recently revamped, three-storey brick pub boasts one of Melbourne’s original rooftop bars with spectacular views of the city skyline. The Roof, formerly known as The Deck, at the Waterside Hotel has a great selection of bar snacks (burgers, chips and wings) and cool cocktails to keep you refreshed all summer long. What’s better than one place to grab a drink? Five in one! At Campari House, there are five levels of entertainment, including two rooftop bars. Enjoy pizza and drinks on the roof, or settle into one of the fully serviced private booths in the two-level lounge. There really is something for everyone at Campari House. Experience a real inner city Melbourne vibe, while sipping cocktails and tasting tempting tapas at Bomba Tapas Bar and Rooftop. With views out over the Lonsdale Street treetops, this smart spot provides the perfect perch to take in the iconic skyline. Open from 3pm daily. 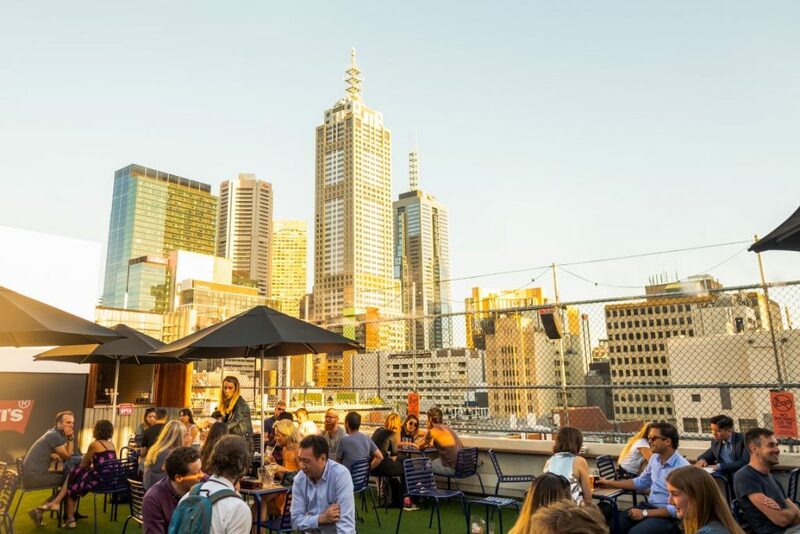 Quite possibly Melbourne’s most beloved skyline bar, the aptly named Rooftop Bar has the distinction of offering drinks, dancing, views, burgers, deckchairs and cinema. Open since 2003, it recently underwent its first ever makeover and now offers enhanced comfort, while maintaining all that was cool about the original bar. Book a ticket for the Rooftop Cinema and enjoy exclusive access after sundown. Madame Brussels is one of the city’s first rooftop terraces and remains a firm favourite. Named after a 19th-century brothel owner well-known for her ‘unconventional’ lifestyle, the self-professed ‘rather fancy terrace and public house’ offers a delightful garden party atmosphere with enviable views over the city’s east side. With its pink walls, garden chaise lounges, white picket fences, faux grass complete with preppy staff in tennis whites, Madame Brussels is the peachy perfect place to visit for a glass of Prosecco or Pimms. 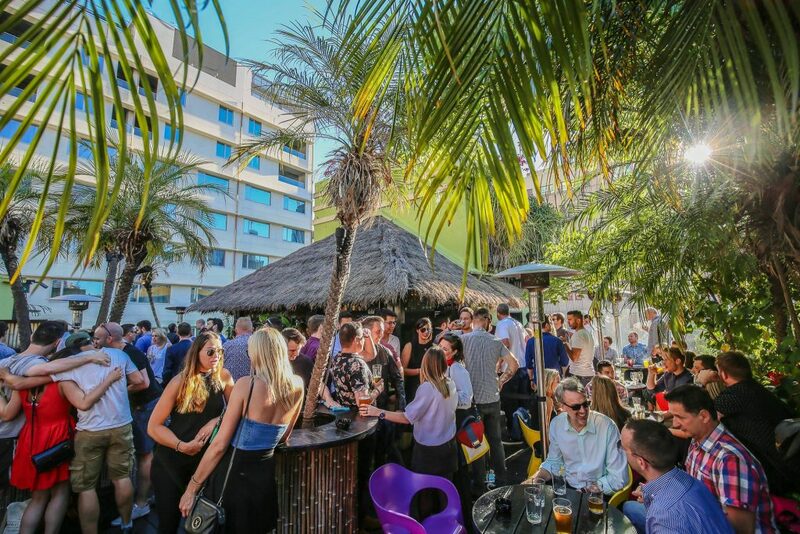 Be transported to an island paradise at Palmz rooftop above the Carlton Hotel. Complete with palm trees, bamboo, bougainvillaea and a thatched hut bar, Palmz provides a little after-work escapism. Weather permitting, this little slice of island life is the perfect place to indulge in pina colada while soaking up some rays. Boasting impressive views of the skyline, Terrace Bar at Sheraton Melbourne, offers a delightful vantage point to wile away a summer’s afternoon. This open air bar specialises in cocktails and tasty tapas, but for something different try a Parisian-inspired afternoon tea with beetroot and goat’s cheese profiterole and mouth-watering macaroons. With unforgettable views, attentive staff and a superbly designed interior – Melina on the Rooftop is a perfect place to unwind with a drink in hand. The Greek cuisine is highly praised by punters, and while there is plenty of ouzo to indulge in, there’s also a cute cocktail menu alongside a selection of fine wines and craft beers. Worth the elevator ride up to the 13th floor. 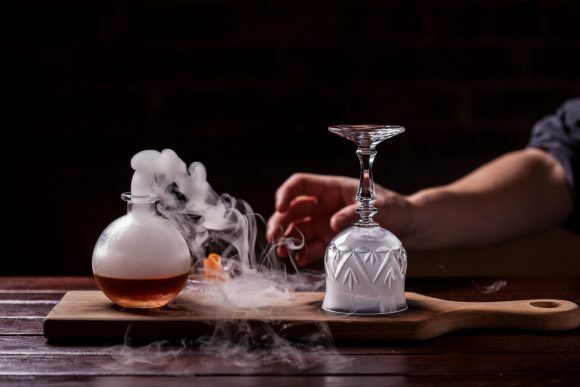 With its subtle nods to the classic fairy tale, Goldilocks offers a creative cocktail list that is just right, with a selection of tasty treats to enjoy on the rooftop. There’s certainly no porridge here, but it is a place for fun, adventure and even has the space to hide from the big bad wolf. When the temperature rises Transit rooftop bar is the place to hang out. Atop this riverside balcony, see the city from above with sweeping views of the Yarra River from the MCG to Southbank. Enjoy the live music as you watch the sun go down and indulge in a cool brew or creative cocktail. And the kitchen can whip up plenty of Asian-inspired snacks so you won’t go hungry. Loop Roof is a sky-high cocktail bar and restaurant made all the more special with its open air, lush green garden setting. On a warm night, try the Token Beer Cocktail with plantation rum, tap beer, house-made pineapple syrup and salt. Looking for more rooftop bars? An icon of Carlton, Jimmy Watson’s houses one of the area’s best-kept elevated secrets, Wolf’s Lair. Enjoy the intimacy of the petite bar or sit up in the treetops among the perfectly manicured gardens. There’s a selection of refreshing beers and ciders, plus a range of local and international wine and bubbles. Taking rooftop bars to new heights is Blue Diamond. Fifteen floors above the city streets, this Art Deco jazz bar is like a 1920s Manhattan speakeasy with a panoramic balcony with what could be the mightiest views of any bar in the city. Cabinet is quaint in the ‘I feel at home here’ kind of way. 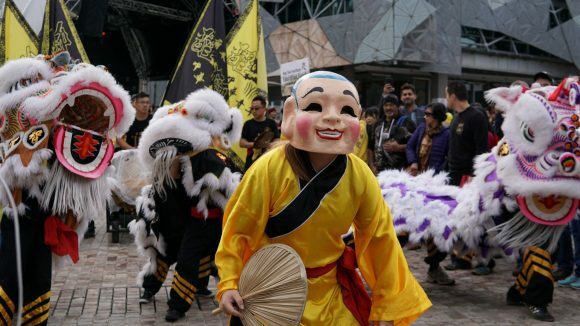 It’s in the heart of the bustling city, and attracts a loyal crowd keen for a refreshing drink while watching the world go by on Swanston Street. Blackboard menus direct you to the selection of snacks, cheese, flatbreads and sharing plates. With an easy-to-miss entry via Tattersalls Lane, Ferdydurke is a hip and lofty space. It offers cocktails, a relaxed balcony and tasty snack menu including a range of gourmet hot dogs and toasties and other ‘hit the spot’ favourites including pulled pork croquettes.